Home » bbc , doctor who , science fiction , television , the day of the doctor » November 23rd is "The Day of the Doctor"
November 23rd is "The Day of the Doctor"
A short while ago the BBC finally revealed the title of the Doctor Who Fiftieth Anniversary Special. November 23rd will be "The Day of the Doctor". Ho-leeee smokes, that is an insanely great piece of work! I have literally watched the final moments of "The Name of the Doctor" at least once on my iPad ever since it aired in May, all because of John Hurt being an incarnation of The Doctor that we never knew even existed. Seeing him strolling away so casually from those dead and burning Daleks - like a man walking straight out of Hell itself - just gives me the shivers. And look! There's a "Bad Wolf" sign! What could it mean?! 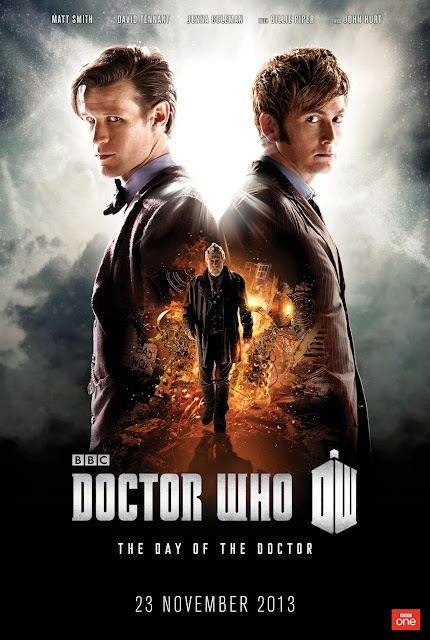 The BBC also announced that "The Day of the Doctor" will have a running time of seventy-five glorious minutes. Edit 6:59 p.m. EST: I can't resist doing it. It's just too good.